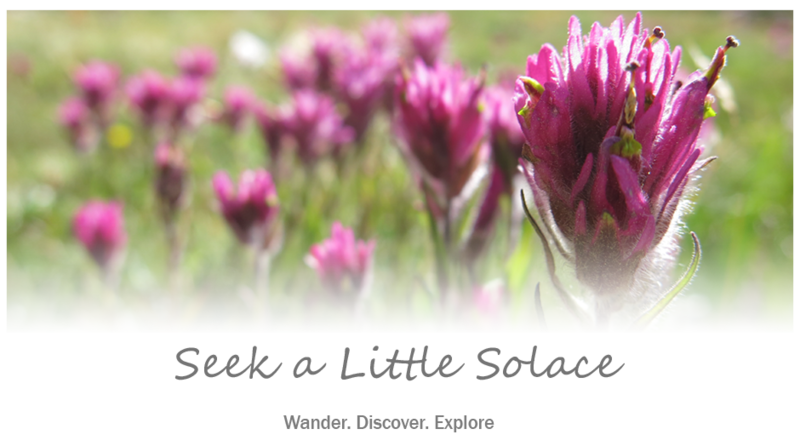 This is the time of year when I begin to feel the welcomed shift from my hectic springtime schedule to the much more relaxed bustle of spontaneous summertime activities. School is out and the kiddos are off to play for the summer. Year-end teaching tasks and deadlines give way to crafty pursuits and trip planning. The days are getting longer and the temperature is quickly warming up. During this time of year raw veggie meals and cold blender treats are much preferred to cooking over a hot stove! So, I spent my first official summer weekend sleeping late, keeping house and stirring up something sweet to celebrate summer’s arrival. First order of business…figure out how to use up our bounty of sweet summer stone fruits before they go to compost. The organic peaches, nectarines, apricots and cherries from our weekly organic produce box have been piling up the last few weeks. I managed to throw the apricots and cherries in the dehydrator and some peaches in the freezer, hoping to be able to use them for something yummy later on. I still had a big bowl of beautiful nectarines and more cherries that needed some attention. And since I found myself with some free time and craving something with a summer flair, I set out to create some sweet summer treats. 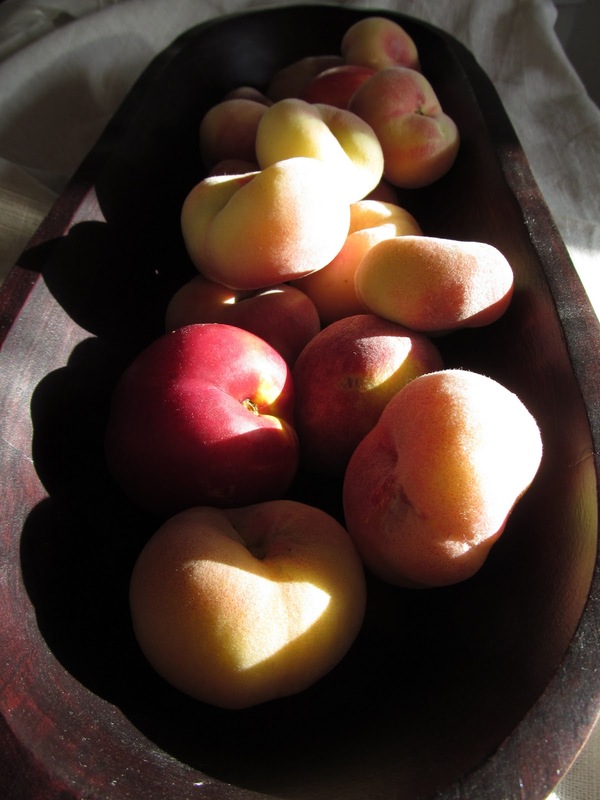 These little white donut-shaped peaches are always scrumptiously sweet and juicy! They are a perfect summer treat plain and fresh from the bowl. I had sliced a bunch and tossed them in the freezer so they wouldn’t go bad before I could get to them. I thought they’d be perfect in a cold summer smoothie. 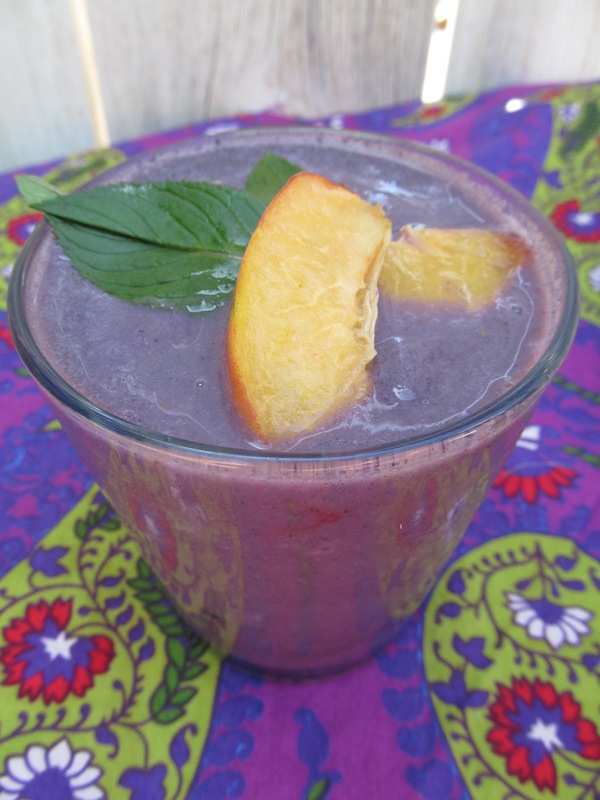 I found a recipe in my new smoothie cookbook and blended up a Maqui Berry Peach smoothie. Maqui berry and camu berry powders add an antioxidant and super C burst to an otherwise simple peaches and cream flavored smoothie. Julie Morris’s recipe calls for rice milk, but I used almond milk and added no sweetener. It was sweet and mellow and made a light, cool breakfast as the early summer sun began to raise the temperature. Now for the cherries and the nectarines. 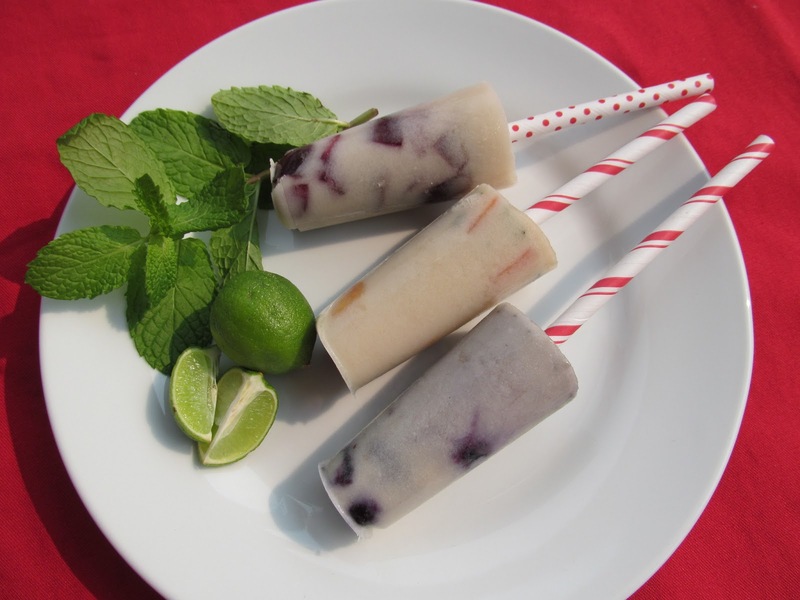 Recently, I had seen somewhere a picture of some luscious looking popsicles made with coconut milk and fresh fruit. 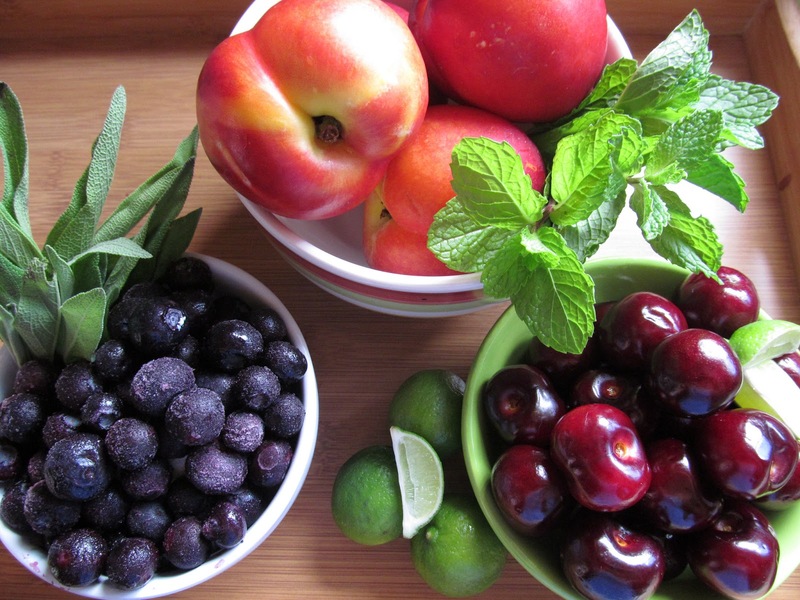 I had some fresh herbs in the fridge, so I decided to experiment with some different flavor combinations: nectarine-mint, blueberry-sage and cherry-lime. These fruity creamsicles could not be any simpler. I sweetened 28 ounces of coconut milk with 1/4 cup agave syrup. This made 12 popsicles. I wasn’t sure which would work better, coconut milk from a can or the carton variety, so I used half and half (14 oz. full-fat from a can plus 14 oz. unsweetened Silk brand from a carton). The herb and lime infusions were very subtle and I actually enjoyed my experimental flavor combos. What a delicious way to chill out on a hot summer day! Well, I still had a whole bowl of nectarines in addition to the apricots I had dehydrated the week before. I found a recipe from Kris Carr’s book for Spiced Peach Crumble. 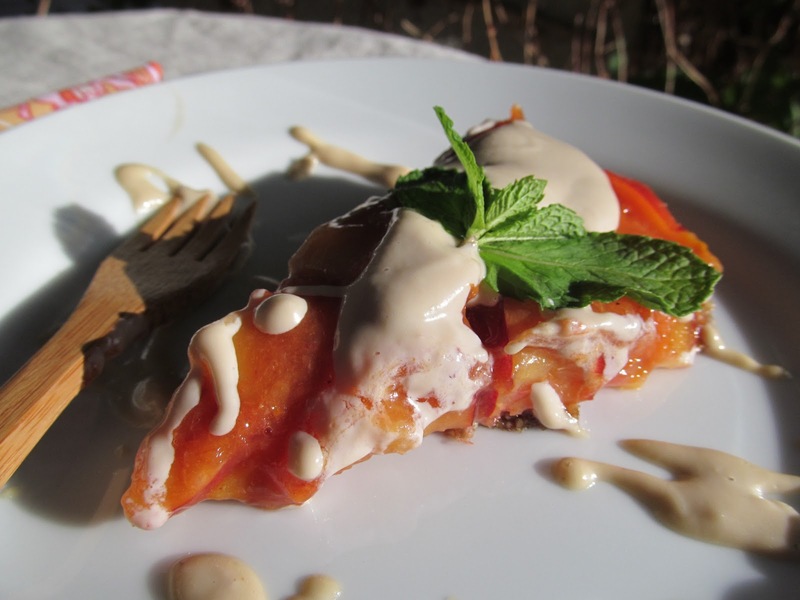 I adapted the recipe and turned my bowl full of organic nectarines into a light and summery tart drizzled with my favorite cashew cream. For the crust, pulse the following ingredients in a food processor until finely ground. Press the mixture into the bottom of a tart pan. For the filling, soak 1/2 cup dried apricots in warm water to rehydrate. Thinly slice 4 nectarines and set them aside. When the apricots are soft, toss them in the blender and blend with the following ingredients until smooth and saucy. 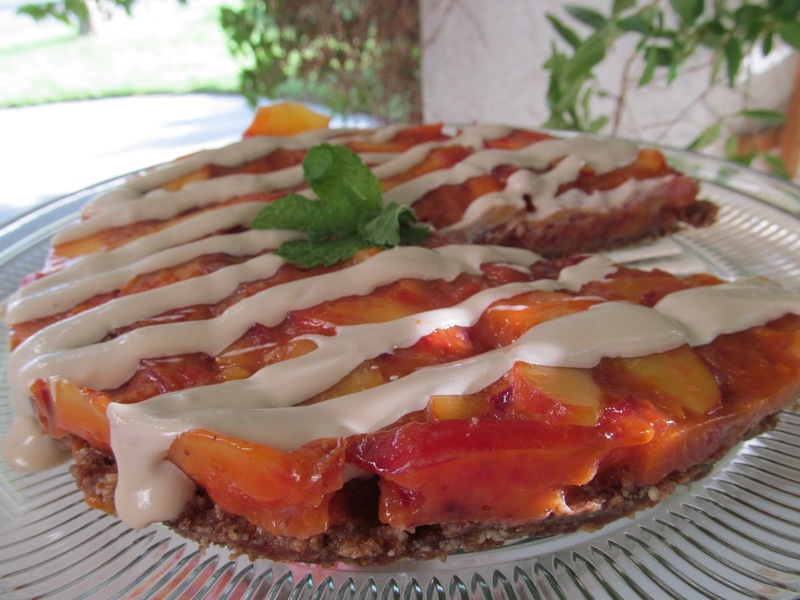 Mix the sauce with the sliced nectarines and pour on top of the crust in your tart pan. It was a pretty saucy filling so, I put it in the freezer for an hour or so to firm up a little. Drizzle with Cashew Cream (find the recipe here.) and enjoy! You are amazing. Everything looks so good and yummy!